Have you thought about exhibiting at eSAX as a way to promote your products / services to 100’s of other businesses? Having a booth is a great way to increase the likelihood of sales, but all of the principles of networking still apply. You are promoting your business, but you are also out there making valuable connections that may lead to sales or future referrals down the line. If you do decide to take the next step in networking, consider these tips for having a successful experience! Set your goals ahead of time! You can get a lot out of an event, but you have to have a good idea of what you want to get out of it. Do you want to collect 50 random business cards, or do you want to really talk to people and end up with 5 genuinely hot leads? Perhaps you want to make a sale that night, or set up a meeting that you are confident will turn into a sale. Or better yet, what if you were to meet the one individual who can change the direction of your business? Maybe you just want to impress some industry leaders and make strong connections with them? Whatever it may be, you should have some way of measurement so when you leave you can know you if experienced a successful event. You could just decide you want to treat the event as a market research opportunity. Ask verbal questions, or get people to fill out a short survey to enter in your prize draw. You can use paper surveys as well as surveys on a tablet for entry into two separate draws! Ask attendees industry-specific information to give you an idea about the marketplace, or business-specific things to find out which logos, banners, website, or tagline they respond better to. There is a great value to this kind of access to your target market, so don’t waste it! Promote the event as though it were your own! This is a great time for you to reconnect with old customers or potential customers, as well as business partners or other associates. Don’t leave the marketing completely to the event management team and just hope that your old connections will learn about the event and feel compelled to go! Increase the chances of gaining more leads by helping to spread the word. Use your blog, newsletter, and social media to advertise your attendance at the event. Mention any on-site promotions, raffles, prize draws, or door prizes that you are giving away. Even better if you can run a giveaway for a free ticket to the event (that you either purchase yourself, or receive from the event manager, as they often give more than one free ticket to booth sponsors). Make sure to tell everyone to bring a friend! Also, keep an eye out for the other sponsors and vendors that may be promoting the event, and cross-promote with them to give your audience even more reason to attend. The more everyone helps to spread the word, the more it helps the event to be an even bigger success. But the true measure of success that you should be after is how it affects your bottom line, or how it can affect your bottom line in the future. More people = more eyes on your business, so go out of your way to treat eSAX as if it’s your own event and spread the word. Before the event, be sure to connect with all stakeholders on social media. That way, if you haven’t already met them in person, it will help make for an excellent conversation point when you actually do meet them at the event! Speaking of which, when you arrive @eSAX, make the rounds and meet everyone who is setting up for the event. It makes a good impression if you prepare a special goody bag or treat for them. It can be as simple as a candy bar with your logo sticker on it, or a little bag with your brochure, business card, a pen, and a cookie. Not only will you be making new connections, but you are also likely opening the door for them to refer attendees to you throughout the night, now that they know who you are and what you do. Not only that, but who knows what referrals they may send your way at a later time. It pays to connect with influencers! It goes without saying that you should have complete branding – banners, table cloths, brochures, business cards, and even your clothing or fashion pieces. What more can you do to get attention and be remembered at an event? Check out this fun little video of eSAX founder Jarrod Goldsmith discussing what personal branding is all about! Start by standing in front of your booth, smiling, and making eye contact. People usually feel comfortable approaching friendly-looking booth folks. Invite people to sign up for your door prize, take a snack or swag item, and ask them how they are enjoying the event. Remember that running a booth does not mean it’s time to become a salesman. It’s all about making the event attendees feel comfortable and at-ease, so ask questions and don’t just pitch your business. You can also get more people to your booth with food! Make sure that the event doesn’t require a food permit of some sort, and then plan on bringing chocolate, cookies, cupcakes, or other treats that will pull people in. Also remember that if you are giving away swag, it should be relevant to the event attendees. The more likely people are to use the item, the better you will be achieving brand awareness. And don’t forget the follow-up! Following-up with folks you meet at a networking event is essential to further the relationship that will eventually (…and hopefully) blossom. You never know where you (or they) will be in the future and how such long-term relationships can develop! Here’s a great video on why connecting with someone is almost as important as the initial meeting! Connect on LinkedIn right away, and have a newsletter ready to go out the next day. Ask your newsletter subscribers to like your Facebook page, but also make sure this newsletter is knock-their-socks off great, chock full of valuable information that will impress them and ensure they want to stay connected with you to continue to receive such great tips and tricks to grow their business. 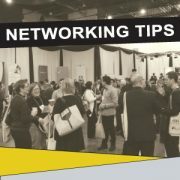 For more great networking tips, subscribe to the eSAX Ask The Fedora YouTube Channel, hosted by Jarrod Goldsmith!